Red Clocks wins the 2019 Oregon Book Award for Fiction, judged by Kim Fu, Hannah Pittard, and J. Robert Lennon. The Red Clocks paperback has gone into its third printing! Red Clocks is a finalist for the Oregon Book Award (Ken Kesey Award in Fiction). Winners announced at the Oregon Awards ceremony on April 22, hosted by Cheryl Strayed. At Nylon, I remember advice from Kate Bernheimer about writing habits and rituals. The Atlantic, Entropy, Book Page, Huffington Post, Minnesota Public Radio, and the New York Public Library include Red Clocks on their Best Fiction of 2018 lists. The Washington Post names Red Clocks one of its 50 Notable Works of Fiction in 2018. Red Clocks is on Multnomah County Library’s Best Books of 2018 list. My new art/text project, “Beyond + Between,” in collaboration with Luca Dipierro, is up at 7 X 7. Esquire U.K. includes Red Clocks on its Best Novels of 2018 (So Far) list. Red Clocks is a Good Reads Choice Finalist for Best Science Fiction 2018. The paperback of Red Clocks is here! Find it at your favorite indie bookshop. I’m in conversation with Genevieve Hudson at Tin House. Red Clocks is discussed in two new articles on feminist dystopias: “How Feminist Dystopian Fiction Is Channeling Women’s Anger and Anxiety” in the New York Times + ”The Remarkable Rise of the Feminist Dystopia” in The Atlantic. Ron Charles gives a shout-out to Red Clocks in his latest newsletter. Red Clocks is on Vulture’s list of 100 Most Important Books of the 21st Century. Les heures rouges was a finalist for the Prix Page America. Manon Walquan m’interviewe dans Cheek. Relojes de sangre, translated by Mariana Hernández Cruz, was just released in Spain by Ediciones Destino. Czerwone zegary, translated by Agnieszka Patrycja Wyszogrodzka-Gaik, came out in August from Czarna Owca. I have a story, "That," in the new Granta. "Check Out These Other Books by 2018's Most Buzzed About Authors"
"Misogynistic Dystopias, Ranked By How Likely They Are in Real Life." Les heures rouges, translated by Anne Rabinovitch, is out from Presses de la Cité. Lisez une critique de livre sur Le Combat Oculaire. I wrote a new short story, "The Moraine," for Portland Monthly's August issue. Jessica Mooney reads Red Clocks alongside Valeria Luiselli's Tell Me How It Ends and Claudia Rankine's Citizen, at The Seattle Review of Books. Electric Literature looks at 7 books that imagine life without landmark Supreme Court cases. The Washington Post Book World names Red Clocks as one of "39 Books We're Talking About This Summer"
The Last Bookstore's Feminist Book Club is discussing Red Clocks on June 20. A new review in the Times Literary Supplement. The Guardian surveys feminist dystopian fiction, including Red Clocks, The Power, and other recent novels. Kerri Miller interviews me on Minnesota Public Radio. Italian journalist Noemi Milani interviews me at Il Libraio. The Women Galore Festival schedule is up. There's a book club discussion of Red Clocks on April 30, and I'll give a reading/talk on May 3. New reviews in The Nation, the Portland Mercury, Christian Century, & The Guardian (UK). New interviews in The Irish Times, Entropy Mag, Moss, and WMFA podcast. Orologi rossi, the Italian translation of Red Clocks, is now out from Bompiani Giunti Editore. ﻿Red Clocks is now out in the UK, from The Borough Press/HarperCollins. New interviews in Stylist UK and Apartment Therapy. PBS Books interview with Rich Fahle, from AWP 2018 (video). "Red Clocks exposes frightening reality of our time": op-ed in Washington Blade. Esquire names Red Clocks one of its "14 Best Beach Books 2018." I interview Chelsey Johnson about her new novel, Stray City, for Tin House. I write about sperm donors & the pursuit of single motherhood in Sunday Times (UK) Style. Stylist (UK) names Red Clocks as one of March's best new books. At IndieThinking, I talk about what led me to write Red Clocks. New radio interviews: Marla Diamond (WCBS Author Talks), Nicole Nelson (KUCI Writers on Writing), and Tom Power (Q). New reviews of Red Clocks in Electric Literature, Entropy Mag, Emerald Street, Grazia, and the Irish Independent (Saturday edition and Sunday edition). I'm going to be on two panels at the PEN World Voices Festival in April: "Handmaid in America" and "Dystopian Fiction: Future Present Tense." Sophie Gilbert reviews Red Clocks in The Atlantic. I talk to April Baer on NPR's Think Out Loud. New reviews up at The Rumpus and Willamette Week. My essay "Maybe There's Nothing Natural About Motherhood" is in The Cut. New interviews with Powell's Books, Refinery29, and Reading Glasses podcast. Naomi Alderman reviews Red Clocks in the New York Times. I talk with Todd Zwillich on The Takeaway (NPR). Red Clocks is recommended in People. Sarah Marshall interviews me in Cascadia. Red Clocks is recommended in the Feb issue of O Magazine. I talk with Scott Simon on Weekend Edition Saturday (NPR). New reviews in the Washington Post, Los Angeles Times, Chicago Tribune, & Seattle Times. Red Clocks makes the Books of the Week list (January 15, 2018) at Publishers Weekly. Red Clocks is on the Indie Next list for February 2018. "The Mender," an excerpt from Red Clocks, is up at Lenny Letter. Dawn Raffel reviews Red Clocks at Oprah.com. Red Clocks is the pick for first-edition subscription clubs at Powell's, Books Are Magic, Skylight Books, and Odyssey Bookshop. I talk with David Naimon on Between the Covers. Interviewed by Deirdre Sugiuchi at Electric Literature & by Amy Wang in The Oregonian. Ron Charles previews Red Clocks on The Takeaway (NPR). Red Clocks in January book previews at The Millions, Entertainment Weekly, Lit Hub, The Riveter, & Vol. 1 Brooklyn. Weekend Edition Saturday (NPR) reviews Red Clocks. Esquire, Tor, Newsday, & Huffington Post include Red Clocks on "Most Anticipated in 2018" roundups. Red Clocks in Poets & Writers: "Page One: Where New & Noteworthy Books Begin." "35 Most Anticipated Fiction Books of 2018" (Bustle). "She Was Warned," an excerpt from Red Clocks, is in the new issue of Tin House. Review of Red Clocks by Fiona Maazel in Bookforum. Profile by Wendy Smith in Publishers Weekly. "What We're Reading" (Marie Claire). "5 Novels for Fans of Margaret Atwood" (BookPage). "30 dystopian novels by and about women" (LitHub). "The 22 Best New Books of Winter" (PopSugar). Review in High Country News. Interview w/ Keaton Gaughan on the U of Portland blog. Starred reviews of Red Clocks from Booklist and Library Journal. Entertainment Weekly's "11 Best First Lines of This Fall's New Books." Amy Jo Burns calls Red Clocks "a reckoning, a warning, and nothing short of a miracle" in "Must Reads for Fall" at Ploughshares. Samantha Irby recommends Red Clocks in a Ravishly interview. Red Clocks is one of the prizes in a feminist book sweepstakes from Little, Brown & Running Press. I'll be moderating a Wordstock panel in November on obsession, ambition, and being lost, with novelists Jessie Chaffee (Florence in Ecstasy), Gabe Habash (Stephen Florida), and Meg Howrey (The Wanderers). I'll be teaching a three-day intensive workshop on the novel at the Tin House Winter Workshop, held at the literary-themed Sylvia Beach Hotel on the Oregon coast, March 2-5, 2018. I'll be a visiting writer at the Juniper Summer Writing Institute at the University of Massachusetts, Amherst, June 17-24, 2018. "25 Must-Read Books," Fall 2017 (PopSugar). I'm lucky to have blurbs on Red Clocks from Emily Fridlund, Kelly Link, Maggie Nelson, Alissa Nutting, Christine Schutt, and Lidia Yuknavitch. Grateful to these spectacular writers for their generosity. "Top 10 Literary Fiction," Fall 2017 (Publishers Weekly). 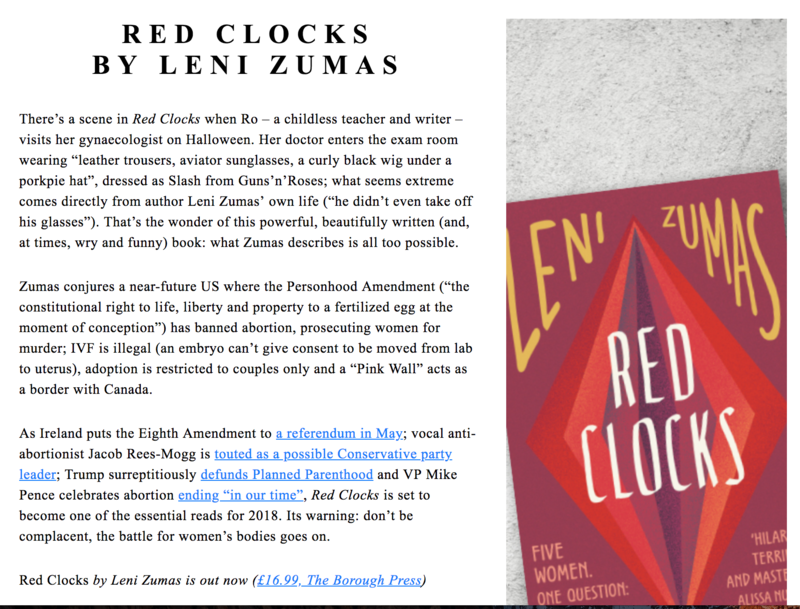 Red Clocks at Book Expo 2017: "Among the books at the show being compared to The Handmaid's Tale (and there were a few), one stood out: Leni Zumas’s Red Clocks. Lee Boudreaux, who is publishing the debut [sic] novel through her eponymous imprint at Little, Brown, in January, said the book, set in an America where abortion is illegal, is about what it means to be a mother" (Publishers Weekly), June 2017.